Between the end of 2010 and the summer 2011, the E-ELT project extended the detailed design phase in order to consider the recommendations of the E-ELT Design Review, and in June 2011 the ESO Council endorsed a revised baseline design for the E-ELT. 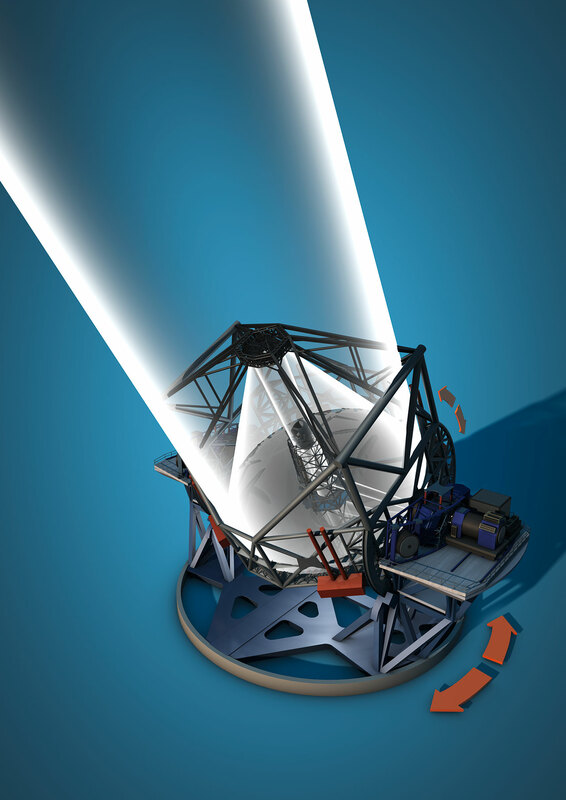 The overall concept of the 40-metre-class telescope remains unchanged. A slight reduction of the diameter of the primary mirror to approximately 39 metres combined with a faster f-ratio, allows a more compact dome and main structure. This leads to a significant cost saving, as well as reduced risk on major items such as the secondary mirror. A summary of the telescope characteristics can be found below, including links to more detailed descriptions. A general principle applied at all levels throughout the design is that technical solutions rely on proven technologies to the maximum possible extent. The E-ELT is a 40-m class, fully steerable telescope, with integrated wavefront control. The optics are mounted on an altitude azimuth telescope main structure, with two massive cradles for the elevation motions and azimuth tracks. The main structure weighs approximately 2800 tonnes. The E-ELT optical design differs from other ELT designs mostly by including adaptive optics into the telescope. This drove the optical layout to five mirrors: a three mirror anastigmat with two flat folding mirrors providing the adaptive optics. This novel five-mirror design results in an exceptional image quality, with no significant aberrations in the 10-arcmin field of view. The major challenges that have been addressed in the design are the need to keep the primary mirror segments within a reasonable range from their prescribed locations and the need to minimize the deflections, both static and dynamic, of the secondary mirror. Two Nasmyth platforms are accomodated by the structure, at either side of the rotatable telescope. Each platform is about the size of a tennis court and can host several instruments. Several designs were considered for the telescope enclosure. The project settled for a rather classical dome design.